is to assist new immigrants and African refugees rekindle commitment, inspire self actualization, empower adults in work environments, and identify youth who are going through puzzled change over living in the United States. We are a 501 (c)(3) exempt organization. We plan to launch new services and expand our reach. Please help us accomplish our goals as an organization. Two more hands can make an enormous difference in the lives of refugees. Be a CANIAR volunteer! Community Access for New Immigrants and African Refugees (CANIAR) and the Barbara Schneider Foundation (BSF) have joined together to host a series of community conversations on wellness in our African community and with those who are interested in working with members of our African community. We are pleased to invite the entire community to be our guest at one of these community conversations, to get to the heart of the matter about what’s important for wellness through responding to the whole person who may be in crisis. Special thanks go to Brooklyn Center Police Department for their active participation. 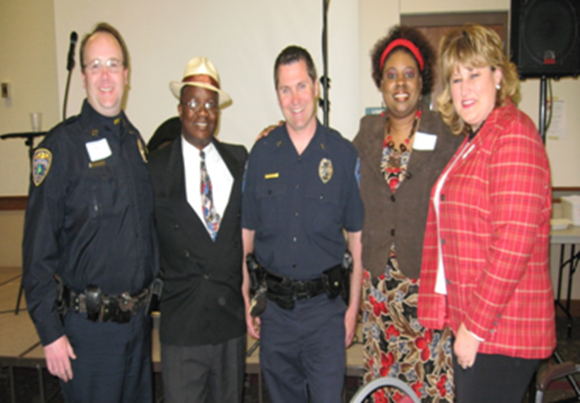 On this day the Human Relations Department of Brooklyn Park honored Mr Augustus Wrayee as one who brings together people of different backgrounds.Deputy Chief of Brooklyn Park Police Department, then Commander, presented the certificate of honor. Standing with Mr. Wrayee from left to right are Deputy Chief Jeff Ankerfelt, Augustus Wrayee, Scott Nadeau, Chief of Columbia Heights Police Department, a visitor (lady in the middle) and Monique Drier, Liaison Officer Brooklyn Center Police Department. The ceremony brought together high ranking officials, present and former City Council members from the City of Brooklyn Park including other officials from the Human Relations Department. Mr. Wrayee is one of the senior members who serve on the Multicultural Advisory Committee Board (MAC) for seven years.